Assessing orientation offers a viable means of concussion screening and measuring the neurological impact of head injuries. In recent years, research and interest in concussion has undeniably hit the mainstream. Mounting evidence articulating the negative effects of concussion on brain health has created a heightened awareness and prompted the NCAA and professional sports leagues to update protocols and increase efforts to make sports safer for athletes. During this time, demand for better tools and technology for assessing and measuring concussion has also grown. However, one major roadblock for any diagnostic or therapeutic agent to reach the market is the lack of definition or accepted diagnostic criteria for concussion. After all, if you don’t define the condition, then you can’t test it. Given the attention concussion has received within the medical community, there is a tendency to think that we know what a concussion is. But if we define it based on the generally accepted idea that a concussion is a headache after a head injury, then probably 40 percent of those individuals who meet that criteria have normal neurological and cognitive function. Thus, any diagnostic that may be specific to some altered cognitive or neurological condition will fail to show efficacy. Despite huge demand to assess and diagnose a concussion, scientists and researchers are still working on how to specifically define it. In severe traumatic brain injury, at least 40 clinical trials in this spectrum have failed because the broad label of TBI does not account for the heterogeneity. If we had diagnostics and therapeutic trials targeted towards well-defined subtypes of TBI, then we could have better success at assessing and diagnosing these conditions. Thus, the future is moving towards defining subtypes rigorously and then qualifying people into those subtypes accordingly. What’s needed is a redefining of subtypes with very rigorous inclusion/exclusion criteria so that we have effective diagnostic and therapeutic trials. Modifiers include sleep disturbance and cervical spine strain. The first two fall under a category of “disorientation,” which can be measured with eye movements. The others (headache, depression, anxiety, and cognitive fatigue) can be best thought of as concussion trigger disorders, in which the concussion or head injury triggers a prior history of migraine or depression/anxiety that could worsen. Importantly, those with ocular or vestibular impairments can also have headache and depression and anxiety, as often there is much crossover in these subtypes. Sleep and cervical spine strain can also modify these subtypes. Sleep disturbances such as multiple nightly awakenings and a feeling of fatigue on awakening are common in symptomatic concussion patients. The main goal of subtyping patients is to target appropriate treatment. Each subtype has specific treatments. In the first couple of days after head injury, the most prevalent, significant neurological cognitive functions impaired are attention (orientation to space and time) and vestibular/balance. Those who have had a “concussion” are three times more likely to suffer another concussion or other injuries because of impaired attention. Therefore, identifying people with attention and vestibular/balance problems or vestibular problems is key. A major function of attention is orienting to sensory information, to enable efficient cognitive or motor processing. The brain orients to dynamic sensory information that is defined by its spatial and temporal qualities. It is orienting to the information we’re taking in to then process. Over 80 percent of sensory information that we process is visual, which usually is dynamic based on the movement of the information. Self-referential, dynamic orientation to incoming sensory information is the brain’s window on the world and is essential in cognitive and motor interactions. An essential part of the neurological exam, especially in assessing patients in the hospital, is the orientation examination. Oriented times three means you’re oriented to person, place, and time. However, the test is really a working memory test: Does the patient know the name of the hospital, date, and time? It is not a true test of whether the patient can orient self-referentially to current time and space in which he/she is located. What we need to measure is whether the patient can orient to dynamic environmental sensory stimuli and not just a static working memory assessment. Monitoring athletes playing sports is extremely important. We want to optimize brain performance and reduce injury. The most common recommendation after a concussion is to rest the body (no exercise) and the mind (don’t look at TV or other screens) until symptoms abate, because this might prolong symptoms and worsen the condition. In fact, the evidence supports early exercise in speeding recovery. Often, kids who are accustomed to physical activity and told not to exercise after a brain injury get depressed and have chronic fatigue problems. This could introduce a whole pandemic of problems that have nothing to do with the head injury. I see this constantly: Kids coming to me from school having been told not to do anything. They’re depressed, anxious, and have chronic headaches. I give them exercise and targeted eye movement exercises for any oculo-motor or vestibular impairments, and they come back the next week feeling great. The most important thing practically is to evaluate what functions are important to prevent further injury. And certainly dynamic vision using eye tracking, vestibular balance function, and coordination, are important and should be continually evaluated. There are lots of reasons for people having attention problems independent of a head injury, one being inadequate sleep. Neurologists have traditionally used eye movement assessment as part of the neurological examination in a very qualitative fashion to ensure that ocular muscles are working properly. Sometimes neurologists look for nystagmus, but often we are not looking at fine eye movements, i.e. how well the eye synchronizes to a target. Eye tracking via Eye-Sync technology allows you to do that through two 15-second tests with an immediate report using portable VR goggles, which help to isolate the environment around the eyes. VR goggles also allow you to do vestibular assessment as well, which means the technology can perform the entire dynamic and vestibular orientation assessments. Eye-Sync is designed to measure how well a brain orients to a predictable dynamic visual stimulus. Tracking eye positions as one follows a target moving predictably in a circle measures spatial and temporal orientation or synchronization of the eye with the target. What we see in concussion patients who have impaired dynamic orientation is that the eyes repeatedly jump ahead to where the target will be. These forward jumps are a sign of dis-inhibition, a well-known consequence of traumatic brain injury. The dis-inhibition in controlling predictable eye tracking is likely a consequence of damage to cerebellar-frontal fibers projections to the prefrontal cortex from shearing forces as the brain undergoes rapid rotational acceleration/deceleration. The brain controls synchronization by essentially inhibiting a predictive drive. Our brain, in predictable interactions, is about 2.5 seconds in the future, and we synchronize with incoming sensory information in the present moment by releasing inhibitory control of the future plan. We can see this in the eye tracking of people who are disoriented; their eyes jump ahead to where the target is going to be. It’s not there yet. These individuals have intact forward predictive impulse, but the problem is that their inhibitory function is impaired. We see that also in their behavior as well, as they tend to be emotionally labile, irritable, and have poor judgment. If we’re truly poised to step into a new phase of concussion assessment, we need to abandon labels and instead pursue practical neurological assessment of functions in patients that they need in their day-to-day lives. Orientation is a key neurological function and is a person’s window on the world to interact with incoming sensory information. Oriented times three is an overly simplified assessment of working memory to place and date/time. Thus, we need to re-examine what it means to be oriented. Moreover, we need better assessments for orientation using sensori-motor synchronization assessments. Jamshid Ghajar, MD, PhD is clinical professor neurosurgery at Stanford University. He is also Director of the Stanford Concussion and Brain Performance Center and President of the Brain Trauma Foundation. To better assess and manage concussion, more emphasis should be given to orientation. Dynamic and vestibular orientation can be measured with eye movements using technologies such as Eye-Sync, which is designed to measure how well a brain orients to a predictable dynamic visual stimulus. 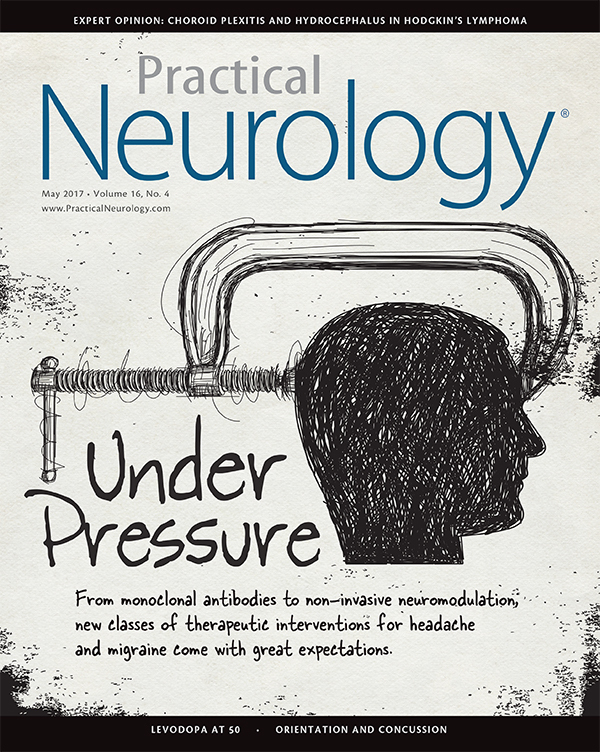 Non-Invasive Neuromodulation: The Next Step in Migraine Care? Neuromodulation devices represent a unique opportunity to patients for effective treatment of migraine in a cost-effective fashion with no significant side effects.